gallereplay: So Michel, what do you particularly like about New York? And why did it inspire you to make your New York cinemagraph collection? Michel Mölder: I was in New York for a video job about 18 months ago. As it was my first time in “The Big Apple”, I decided to stay a little longer to explore. It’s a crazy city, I completely fell in love with it! My experience filming as a cameraman and passion for movies meant that New York was an experience in itself; the whole place feels like a movie set. The high-rise buildings, the cafes, central park, the people … it all felt so familiar! It was just like watching a film! Roughly around my time in New York is when I started experimenting with cinemagraphs. I had barely explored the medium and I knew little about the do’s and don’ts. So with the inspirational views of New York at my disposal, I shot multiple frames. A lot of my initial work was trial and error, although some didn’t work out, other attempts look great! gallereplay: Cinemagraphs and travel often come hand in hand. Why do you think they complement each other so well? Michel Mölder: Cinemagraphs are a great medium to spice up holiday pictures. All you need is a camera and a tripod, plus a little extra time back home to turn the videos into magic. Some of our fondest memories are made travelling, and cinemagraphs are able to make the memories live on through their continuous motion! gallereplay: So true! 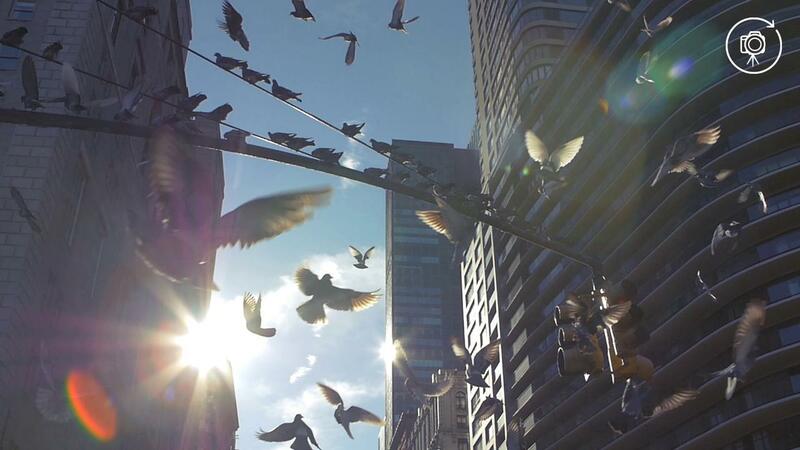 Could you give us a little detail regarding your cinemagraph “Big Apple Birds”? Was it particularly difficult to shoot? Michel Mölder: Sure. When I was walking around in New York one morning, close to central park, I noticed all these pigeons perched on wires. I quickly setup my tripod, pressed record and clapped in my hands to unsettle them. Most of them flew away which looked great since the sun backlighted their wings. During post-production, I tried to find a single bird that wasn’t overlapping the other birds in the sky. At the time, YouTube tutorials were my best friend, as I was starting to learn After Effects. Rotoscoping birds overlapping would be have been too tricky at the time, so it took me some time to find the perfect bird to use. I started looking for individual birds where their wings were expanded frame by frame, which I then froze and masked out on a separate layer. Every single bird that I expanded and froze was put on a separate video layer, which I could then put on or off. gallereplay: Wow, that sounds like a lot of tricky, technical work! How long did it all take? Michel Mölder: Since I was still learning the layout and workflow of After Effects, this took me about two and a half days! I ended up with about 20 video layers of frozen birds and 1 layer for the bird flying from outside the frame towards the wire. This was the first time I viewed the final video as a cinemagraph, and although I loved it, there was a slight problem: I didn’t really like the bird disappearing from the wire after flying into the frame. Michel Mölder: Well, I tried to fix this by using a bounce instead of a loop, but sadly it looked a little fake. However, when looking back over the original footage I found the solution. There was one single bird flying from left to right that overlapped the entire frame. I wanted to find out if I could use this motion as a “natural” wipe, so the reappearance of the flying pigeon wouldn’t be so obvious. I hoped it would effortlessly fall back in the starting position after the wipe of the other bird! And in the end, it worked out really well! gallereplay: We think so too! It’s a special cinemagraph. Finally Michel, in terms of motion in cinemagraphs, you’ve got a diverse range of work. Some are particularly subtle, others more obvious. Is there a type of cinemagraph you prefer or enjoy making more? Michel Mölder: I specifically love cinemagraphs which make you look twice. In my eyes the medium is most powerful when time is both moving and frozen in one single frame. I’ve experimented a lot with varying types of movement, but I mostly like the movement to be subtle, otherwise it all just looks like a video-loop to me. The medium is still very young but more and more people are starting to love these living photos. These are great times for cinemagraph creators! Check out Michel’s gallereplay profile to see more of his cinemagraphs.